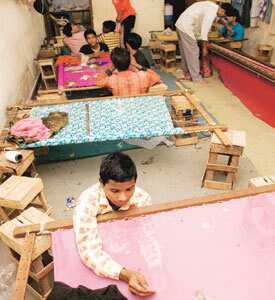 Just another day: Children working at a garment factory in Shahpur Jat. Many factories in this area employ children to do embroidery work. Delhi / Bangalore: A day after UK’s The Observer newspaper reported that children, many of them sold to employers by their impoverished families, were being used by a New Delhi-based sub-contractor of a Gap Inc. supplier to manufacture a line for the company’s GapKids range, nothing much had changed in the Shahpur Jat area, where the newspaper said the factory was located. The tiny, underdeveloped urban village is an overcrowded centre of manufacture for apparel and jewellery. Children can be seen working on intricate embroidery designs in rows of garage-like tailoring units. Hand-stitched items usually command a premium in the international market; The Observer said the children were making hand-stitched blouses for girls for the Christmas season (the blouses were to retail at $40, or Rs1,576, a piece, the paper reported). “We have seen the news report; I don’t say there should be child labour, but I don’t think any shop in this area can function without children working for them. All of them have basement factories where children are employed to do work such as embroidery," said a shopowner in the area, who did not wish to be identified. The newspaper did not identify the supplier or the sub-contractor, and executives at Gap’s local sourcing office declined to comment saying they were not authorized to speak to the media. In a statement, Gap said the supplier had outsourced manufacturing to a sub-contractor “in direct violation of our agreement". The company added it has cancelled an order for girls’ blouses and sent letters to 2,000 suppliers, calling for a meeting to reinforce its policy on child labour. The company also said that it had begun its own probe into the issue after being informed of the newspaper investigation on 22 October. “Under absolutely no circumstance is it acceptable for children to produce or work on garments. It is non-negotiable," said Dan Henkle, the company’s senior vice-president of social responsibility. The Indian government has consistently refused to comment on child labourers being used in the country’s flourishing apparel manufacturing industry, which does business, mostly international, worth $20 billion a year. However, Shirin Khan, a child labour expert for South Asia at the International Labor Organization (ILO), said: “An incident like the one with Gap can happen anywhere in India; because of the large size of the informal economy, a large number of children do end up working." Khan added there are around 122 million children between the ages of 5 and 14 across Asia involved in economic activity. The Child Labour (Prohibition and Regulation) Act, 1986 bans employment of children below the age of fourteen years in factories, mines and hazardous employment and regulates the working conditions of children in other employment. In 2006, the government regulated the employment of children as domestic help and in shops, restaurants and entertainment centres. However, some exporters saw a conspiracy in The Observer’s investigation. “The whole episode is part of a process to create a non-tariff barrier between India, and the US and Europe," said Partho Kar, chief operating officer of Madura Garments, which employs 5,500 people and supplies to Marks and Spencer’s, Tommy Hilfiger, and Ralph Lauren, among others. Kar added the report could have been instigated by Chinese manufacturers. “I would not be surprised if there is involvement of a third party in it (the investigation), to divert orders to their country," added M.K. Panthaki, director at the Clothing Manufacturers Association of India, an industry body. Panthaki said the government should step in (to protect the interests of Indian exporters) if Gap and other companies cancelled their orders. A few months ago, Clean Clothes Campaign, a network of international non-governmental organizations, had accused Bangalore-based Fibers and Fabrics International (FFI), which supplies to companies such as Gap and Mexx, of labour rights violations. The company had denied these allegations. “We cannot manufacture if we do not adhere to labour norms...; we have agents (of the customer) present inside our factory...," said Mohammed Ghiase, director at FFI. Around the same time, another British newspaper, The Guardian, had reported that Gokaldas Exports Ltd (since acquired by private equity firm Blackstone), which supplied to brands such as Mothercare and H&M, paid its employees wages that were lower than those mandated by the Ethical Trading Initiative, guidelines on pay and employment conditions across the supply chain. Mothercare and Gap are both members of ETI. Executives at Gokaldas declined to comment on the issue.